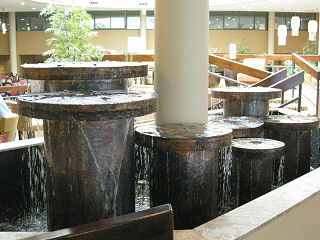 This fountain was created for the lobby of the Hilton Hotel in Huntington, New York. The fountain consists of seven units that rise from the water's surface in the shape of "Lilly Pads" . The Lilly Pads are contained in a cement basin that is 16' wide x 8' deep. This is a visually and audibly conspicuous fountain with a massive amount of water overflowing through the top of the Lilly Pads. As a guest enters the hotel they first realize the sound of the calming water. 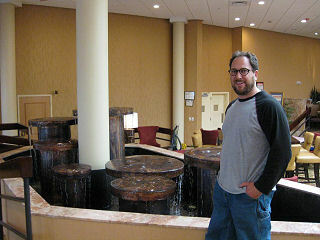 This fountain was a smashing success and I appreciate the folks at the Hilton for selecting me for this project.